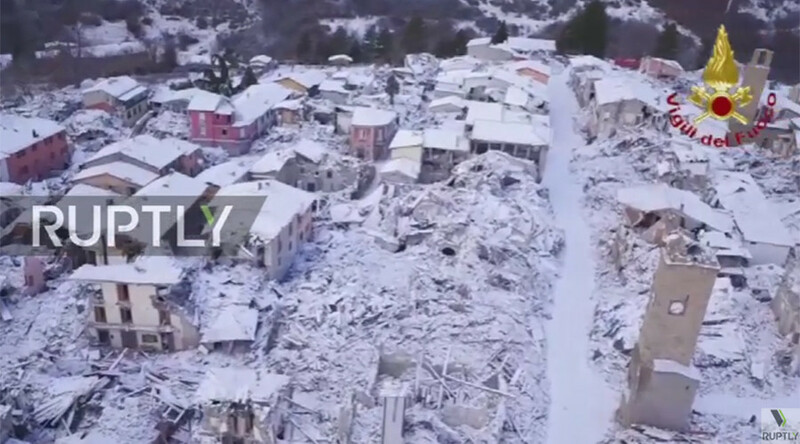 An evocative drone video of a snow covered Italian town that was hit by a powerful earthquake and hundreds of aftershocks earlier this year shows the devastating impact of the natural disaster. The small ancient town of Amatrice in central Italy was reduced to rubble in August after a 6.2-magnitude earthquake rocked the region, killing around 300 people. Amatrice, which was close to the epicenter of the quake, was the worst affected area, enduring the most fatalities and facing almost total destruction. New drone footage taken in the grip of a cold front shows the magnitude of damage caused to Amatrice by the quake. The eerie birds eye view footage shows a ravaged ghost town blanketed in snow and was shot by Italy’s fire service, who were instrumental in initial search and rescue efforts. The haunting video also reveals the extent of work that still needs to be done as the town lies in rubble and ruin. Clean up efforts, first delayed by aftershocks, have now been hampered by bad weather conditions. Central Italy has been overwhelmed with seismic activity in recent months affecting a number of areas. A 6.6 magnitude earthquake caused major damage in October. The Pope met with survivors of the disasters Thursday, three months after he travelled to Amatrice to offer comfort.